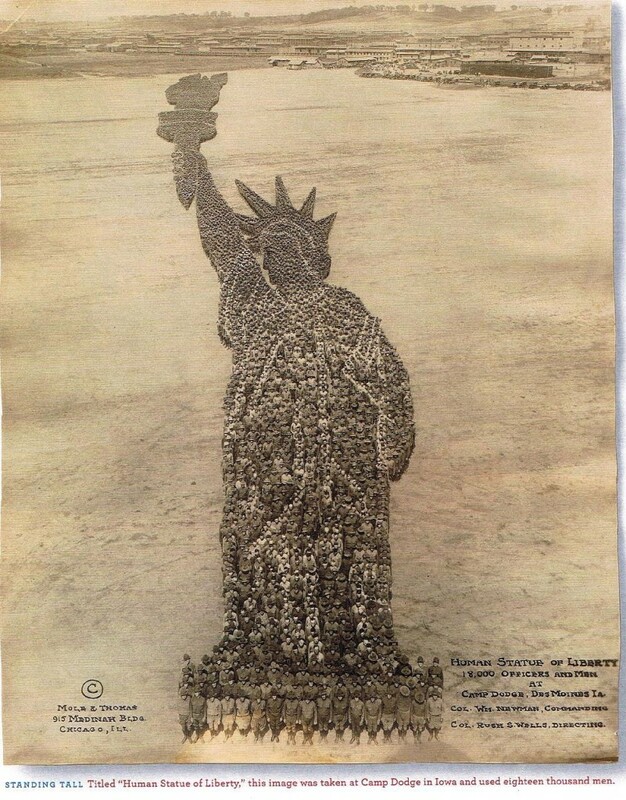 The photograph of Lady Liberty formed by 18,000 posed soldiers was taken in July 1918 at Camp Dodge, in Iowa, by photographers Arthur S. Mole & John D. Thomas. It was intended to help promote the sale of WW1 war bonds unfortunately, it was never used. In fact, during WW1 years Mole and Thomas had created incredible human images using thousands of soldiers or sailors dressed in woolen uniform to create images. According to information, the design for the living picture was laid out at the drill ground at Camp Dodge, situated in the beautiful valley of the Des Moines River. Thousands of yards of white tape were fastened to the ground and formed the outlines on which 18,000 officers and men marched to their respective positions. The day on which the photograph was taken was extremely hot, neared 105 degrees F and the heat was intensified by the mass formation of men, and apparently some men fainted. The dimensions of the platting for the picture seem surprising. The camera was placed on a high tower. From the position nearest the camera occupied by Colonel Newman and his staff, to the last man at the top of the torch as platted on the ground was 1,235 feet, approximately a quarter of a mile. However, the appended figures below will give sufficient idea of the distorted proportions of the actual measurements for this photograph. Incredible as it may seem as there are twice the number of men in the flame of the torch as in the whole remaining design, while there are 8 times as many men in the arm, torch and flame as in all the rest of the figure. It is noted that the right thumb is five feet longer than the left hand, while the right arm, torch and flame is 8 times the length of the body.